Hannan freshman Bailey Coleman delivers a pitch during the Lady Wildcats 16-10 loss in the opening contest of a doubleheader versus Tolsia on Thursday night in Ashton, W. Va.
Hannan sophomore Kassidee Bush drives a hit down the third base line during the Lady Wildcats 16-10 loss in the opening contest of a doubleheader versus Tolsia on Thursday night in Ashton, W. Va.
ASHTON, W.Va. — A long night … and a lot of runs. 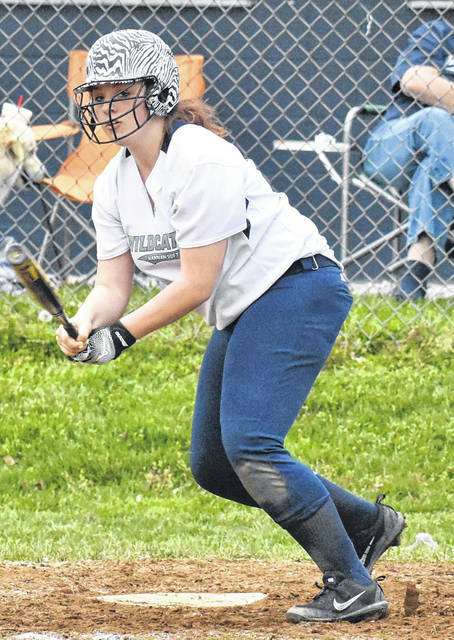 The Hannan softball team scored a total of 19 runs in their doubleheader with visiting Tolsia, as they suffered a 16-10 setback in the opener and a 9-9 tie in the finale on Thursday night in Mason County. In the opening contest, the Lady Wildcats (0-8-1) trailed by seven runs in the bottom of the second, as Jessica Dalton reached on a one-out single and later scored on a two-out hit by Halie Johnson to cut the deficit to 7-1. The Lady Rebels extended their lead in the top of the third, as they manufactured six runs on four hits and three walks in inning to take a 13-1 advantage. 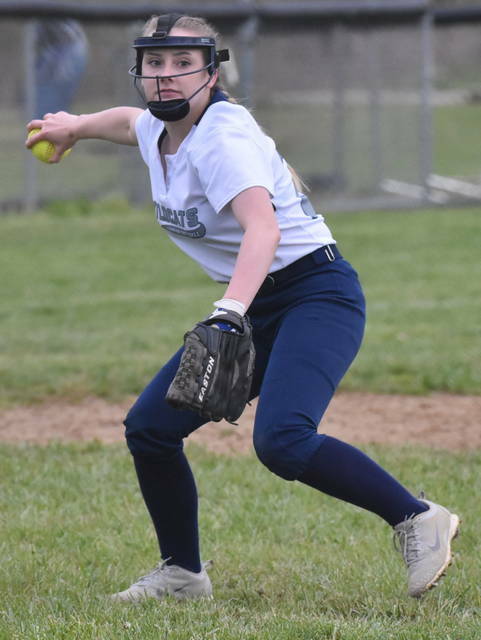 HHS narrowed the margin to 13-4 in the bottom half of the third, as Dalton, Josie McCoy and Pamela Ochs each scored runs in the frame. THS added one run in the fourth, when a lead off hit by Isabella Simpkins allowed a double by Alexandra Sturgill in the next at bat to extend the Lady Rebel’s lead to 14-4. Hannan plated two runs in the bottom of the fourth, as Ochs and Bailey Coleman scored to close the gap to 14-6. The Blue and White pulled within four runs of the visitor’s lead in the fifth, as they sent nine hitters to the plate in the frame and scored four runs on on four hits and three walks to cut the deficit to 14-10. The Lady Wildcats were held scoreless over the remaining two innings, as the Lady Rebels added two runs in the finale to take a six-run victory in the opening game. Josie McCoy suffered the pitching loss as she surrendered four runs on two hits, with two walks and one strikeout in one inning of work. McCoy finished with one hit, walked three times and scored twice in the game. Coleman provided six innings of relief and allowed 12 runs, nine hits, while walking six and striking out one hitter. Coleman also had one hit and scored a run on the offensive side. Dalton led HHS at the plate with four safeties and also scored two runs. Ochs followed with three hits and three runs scored. Oliva Norris and Halie Johnson were next with two safeties each, while Karria Hall concluded the hit totals for Hannan with one hit. The finale was tightly contested as both clubs were limited to three runs scored per inning. Both clubs ended in a 9-all tie at the close of three-innings of play, as Hannan manufactured nine runs on three hits, four walks and four Tolsia errors. In contrast, the Lady Rebels scored nine runs on four hits, with six walks, one hit batter and one error by the hosts. Bush, Coleman and Mcoy each finished with one hit apiece, respectively, to conclude the hit totals for HHS in game two. 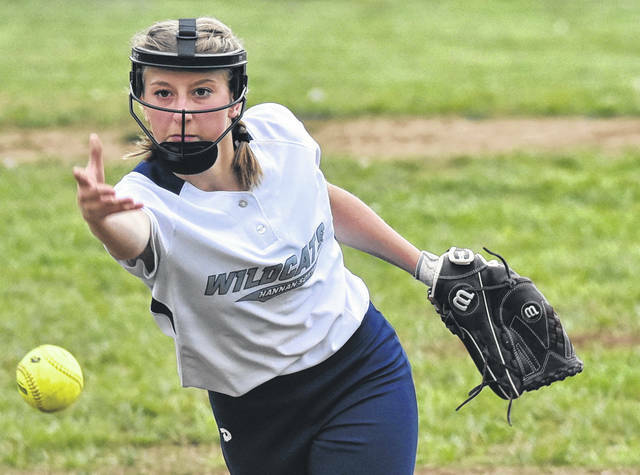 Coleman pitched for one inning for the Lady Wildcats and surrendered three runs on two hits. Johnson provided two innings of relief, allowing six runs on two his, with six walks while striking out one hitter. Kristina Maynard pitched all three innings for THS in the finale. Simpkins led the Lady Rebels on offense with a home run, two RBI, a walk and two runs scored. Jasmine Hale followed with a triple and also scored a run. Wilson and Maynard also had one hit apiece, respectively, to conclude the hit totals for Tolsia in the second game. Following the game, HHS Glen Hodges head coach focused on the positives of his team’s performance — particularly with they play of his young players and the upcoming postseason.